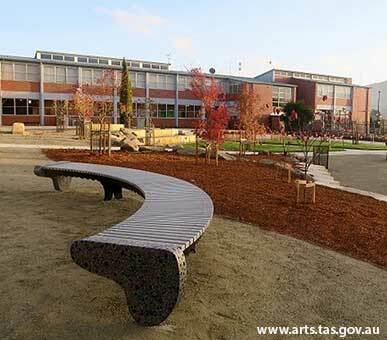 ARTIST Wayne Hudson’s Arc Bench has recently been installed into the newly-landscaped area in the grounds of New Norfolk High School. The bench has been designed to act as a focal point in the central space and be a catalyst for students and staff to gather and where formal/informal learning can take place. Treated wooden slats have been attached to a curved metal frame of the bench. The ends are made from cast concrete which has been embedded with coloured glass and then polished. This $19,000 Arts Tasmania project forms part of the school's redevelopment which included the demolition of the original school building to make way for the new landscaped area.